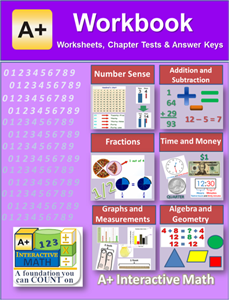 Each grade level workbook includes a worksheet for each lesson, an exam for each chapter and answer keys. The workbooks are designed to go with printed (or eBook) textbook or to supplement the CD Software and the Math curriculum Online. The workbooks provide an added convenience for parents and students where students can do all their work in one convenient place. Students can document the step-by-step process they follow to arrive at a solution to each problem. Spiral or comb bound for ease of use. Also available as eBook (PDF). Click below for detailed Table of Contents for each grade level.